On Saturday 5th and Sunday 6th November, with past and present troops in mind, the Suffolk Owl Sanctuary hosted a special remembrance weekend. With serving troops and veterans as our guests, we staged some special events and Jenny’s Ark paid us a special visit with her entourage of weird and wonderful beasties in tow for the youngsters. Another very special and apposite guest - given the association with the American Armed Forces - was Shelby the Bald Eagle. 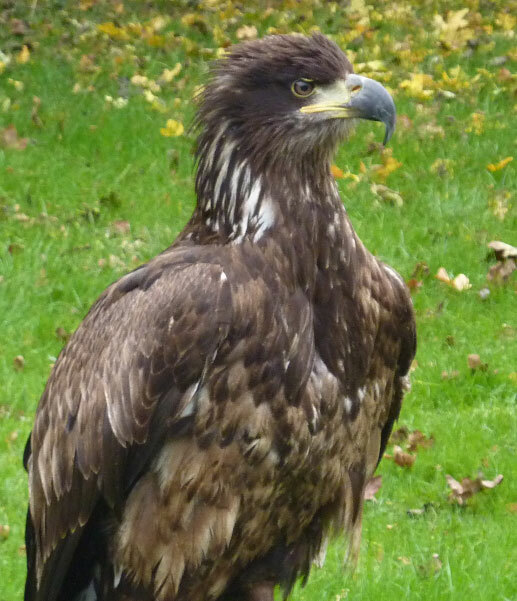 Courtesy of Trevor Fowles, one of our erstwhile colleagues, young Shelby was brought along from the Warren Hill Raptor Unit. Although our demonstration birds are now generally resting over the winter months, the falconers staged an exclusive flying display for the event. The participants were Taiga the Great Grey Owl, who started the flying season late because he was moulting early on, Henry the Harris Hawk, who at this time of year is one of the hunting day birds and Phyllis the Spectacled Owl, who joined us during the summer and only had her flying debut towards the end of the season. Then came the stunning finale as Trevor flew Shelby in all her vast and glorious splendour. With a wingspan of up to 2.3m (or 7.5 feet if you prefer proper measurements - no indicator of the writers age at all) the Bald Eagle is a truly awe-inspiring sight in flight and with a possible mass of 7 kilograms (or 15lbs – that’s over a stone) is no lightweight to handle. As Shelby hurtled towards Trevor’s awaiting glove, it seemed he must be bracing himself against the full force of such speed and weight and yet at the last moment, graceful as a swan, Shelby slowed and alighted, soft as a feather onto Trevor’s arm. Dramatic stuff! A big thank you to Trevor and Shelby for their wonderful contribution. Our thanks also go to Scotty’s Little Soldiers, with their charity stall to support the Children of the Fallen, and K&P catering, who provided a much welcome barbecue, for helping to support our event. To cap it all, it’s not often we have a Green Goddess and an American Jeep parked outside the Sanctuary and we’d like to thank Harry Reynolds and his fellow Military Vehicle Historian for bringing the vehicles to add atmosphere to the event and for the wealth of enthusiasm and knowledge they imparted to visitors. Over the last few weeks, several raptors have been brought in to our hospital. On the 1st of October, a Tawny Owl found in Flempton came in with a bruised wing. It had clearly been the victim of an RTA as is sadly so often the case, but made a good recovery and was released where it was found on the 29th October. On the 17th October we also received a fledgling Barn Owl that was still unable to fly. Fortunately, it only took a week in a rehab aviary for the little fellow to gain the strength and skills to make his own way in the world and he was duly released on the 30th October. Unfortunately, another victim of an RTA, a Tawny Owl was less fortunate and after a week of treatment it was clear the kindest thing would be not to prolong it. We also had a very thin Kestrel brought in that had become too emaciated for treatment to be effective. Such cases are never easy to deal with, but as always, the falconry team have the best interests of their charges at heart.